The Ryobi 3302M and 3302H presses are exactly what we mean when we talk about "best of breed". There is no better or more productive 2-head, 11x17-plus press in the business. In combination with Anthem metal plates made on our Presstek Dimension 200 Platesetter, the quality of single and multi spot-color work we do on the 3302 is beautiful - perfect registration, 150 lines-per-inch, 2540 dpi - large solids, with a screen and halftone density range from 2% to 98%! All at a reasonable cost and fast turnaround. 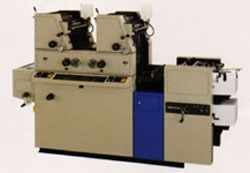 This is real commercial-grade offset printing.